This follows up on my previous measurements of static properties of Firefox code on x86-64 with some measurements of dynamic properties obtained by instrumenting code. These are mostly for my own amusement but intuitions about how programs behave at the machine level, grounded in data, have sometimes been unexpectedly useful. Dynamic properties are highly workload-dependent. Media codecs are more SSE/AVX intensive than regular code so if you do nothing but watch videos you'd expect qualitatively different results than if you just load Web pages. I used a mixed workload that starts Firefox (multi-process enabled, optimized build), loads the NZ Herald, scrolls to the bottom, loads an article with a video, plays the video for several seconds, then quits. It ran for about 30 seconds under rr and executes about 60 billion instructions. 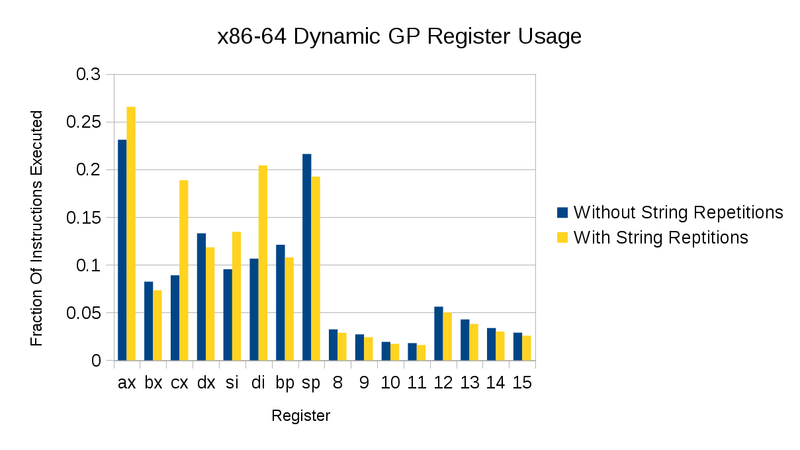 I repeated my register usage result analysis, this time weighted by dynamic execution count and taking into account implicit register usage such as push using rsp. 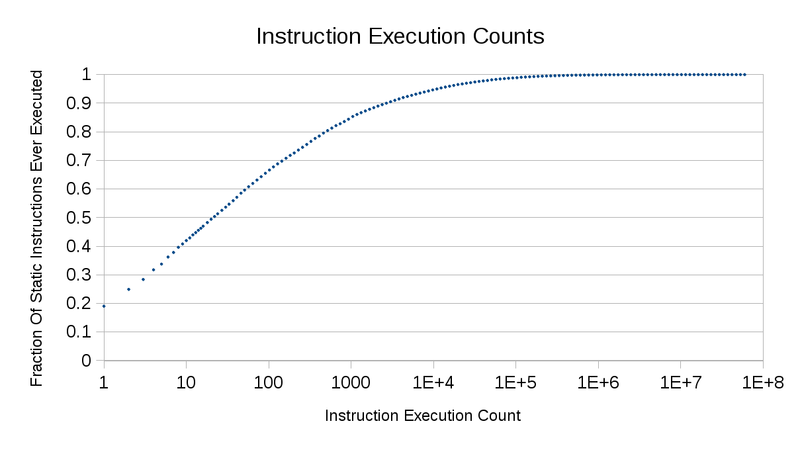 The results differ significantly on whether you count the consecutive iterations of a repeated string instruction (e.g. rep movsb) as a single instruction execution or one instruction execution per iteration, so I show both. Unlike the static graphs, these results for all instructions executed anywhere in the process(es), including JITted code, not just libxul. As expected, sp is very frequently used once you consider its implicit uses. String instructions aside, the dynamic results don't look very different from the static results. Registers R8 to R11 look a bit more used in this graph, which may be because they tend to be allocated in highly optimized leaf functions, which are more likely to be hot code. 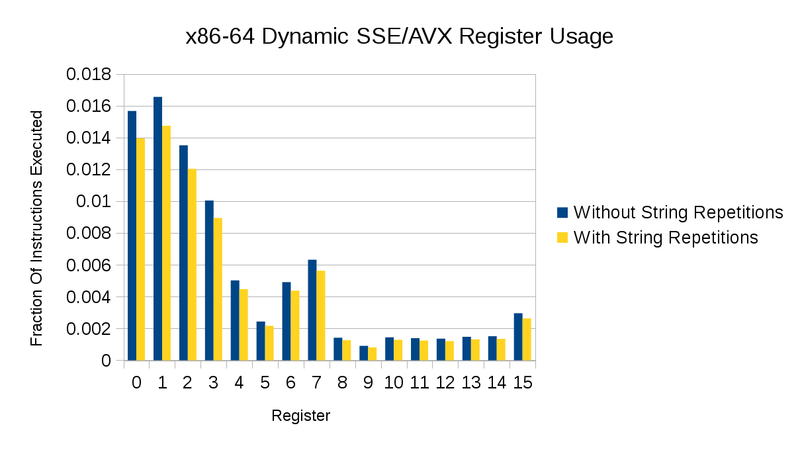 The surprising thing about the results for SSE/AVX registers is that they still don't look very different to the static results. Even the bottom 8 registers still aren't frequently used compared to most general-purpose registers, even though I deliberately tried to exercise codec code. I wonder why R5 is the least used bottom-8 register by a significant margin. Maybe these results are dominated by a few hot loops that by chance don't use that register much. That's five instructions executed for every four bytes written. This could be done a lot faster in a variety of different ways --- rep stosd or rep stosq would probably get the fast-string optimization, but SSE/AVX might be faster. For the low point of R5 in the SSE list, I expect it's because of algorithms that do most of the work at the top of the list (0,1,2,etc), and then use the bottom of the list (7,6,5) as temp/intermediate storage. (I vaguely remember that being needed for certain video codec work I looked at long ago.) From the starting point, frequency of need for an additional register drops off in a predictable pattern (eg: -20%, -30%, -40%, etc, for each additional register), with a natural minimum between the two sides at R5, since R7 is much lower starting off than R1. R1 is probably used as a temp for R0 for small operations, which would be why it ends up being the peak at the top of the list.